Crafted for ease of use, our S100 series features a wide variety of brush types. The handle is made of wood colored in rich vermillion, a traditional Japanese color. The handle broadens slightly towards the bottom. Sumptuous to hold and superbly balanced for easy handling. The brass ferrule is 24-karat gold plated with clear coating. 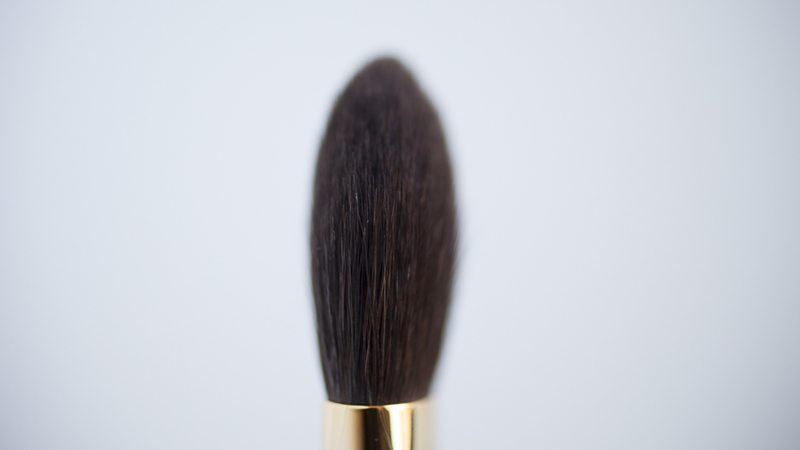 Features (S111): This blusher brush provides sheer coverage and is soft on your skin. "Soft on your skin" is an understatement! And, of course, I had to get their soap which they recommend using to clean their brushes. I was curious about the Smith Cosmetics brushes. To be perfectly honest, I was simply intrigued because I loved the look and feel of the wood barrel. So I got some teeny tiny detail work brushes 202 and 203. I'm regretting not getting their portfolio system. Next year! After circling the Anastasia BH booth a few times, we finally jumped on line when it dwindled to almost nothing. Overwhelmed again by the selection and discounts, I walked away with three lip glosses: Fudge, Vamp and Metallic Rose. They all have that same birthday cake scent of the Jouer Lip Cremes, which doesn't necessarily bother me, but I'm not the biggest fan of the super sweet scent. I also picked up a Dipbrow Pomade in Ash Brown and a Tinted Brow Gel in Granite. I wanted to compare it to Glossier's Boy Brow. We shall see. I'm not even sure I picked up the right colors! The longest line we waited on was for Sugarpill. Initially I got on line to buy a present for a friend - the aesthetic is something out of her dreams - but I also ended up getting a Loose Eyeshadow in Penelope, a fun rose gold glitter for myself. We walked by the Beautylish booth, and while I was a little disappointed they only had Natasha Denona, I was happy I could see her line in person. To see her eyeshadows in person is to love them. So impressive when you swatch them, I'm anxious to see how they actually wear. I purchased three of the 5-pan Eyeshadow Palettes: No 2, 4 and 8. I'm regretting not purchasing No. 9, but I may just get it off their site since they weren't offering any discounts at the show anyway. And finally, we swung by the Alcone booth and I picked up some Skindinavia sprays. I intended to only get the setting spray, but was intrigued by the primer spray. I'm gearing up for another hot and humid NYC summer, so the idea of a primer spray vs. primer lotion is very appealing. I'll report back on how it works! !